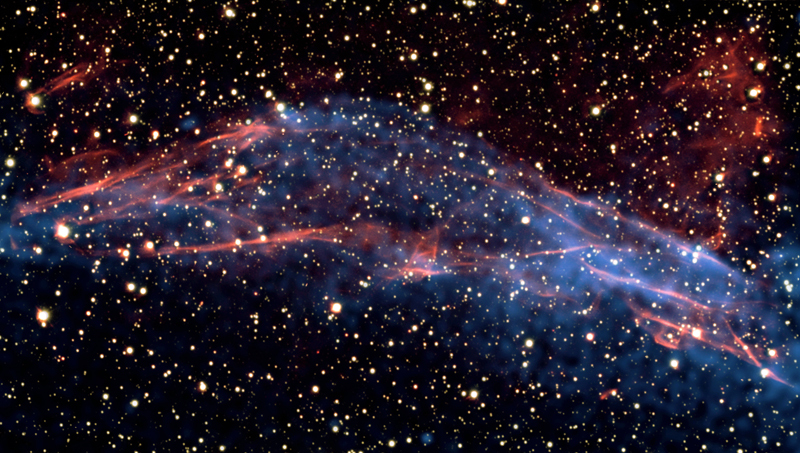 This image of data from NASA's Chandra X-ray Observatory and the European Southern Observatory's Very Large Telescope shows a part of the roughly circular supernova remnant known as RCW 86. This remnant is the remains of an exploded star, which may have been observed on Earth in 185 AD by Chinese astronomers. By studying this remnant, a team of astronomers was able to understand new details about the role of supernova remnants as the Milky Way's super-efficient particle accelerators. The team shows that the shock wave visible in this area is very efficient at accelerating particles and the energy used in this process matches the number of cosmic rays observed on Earth. 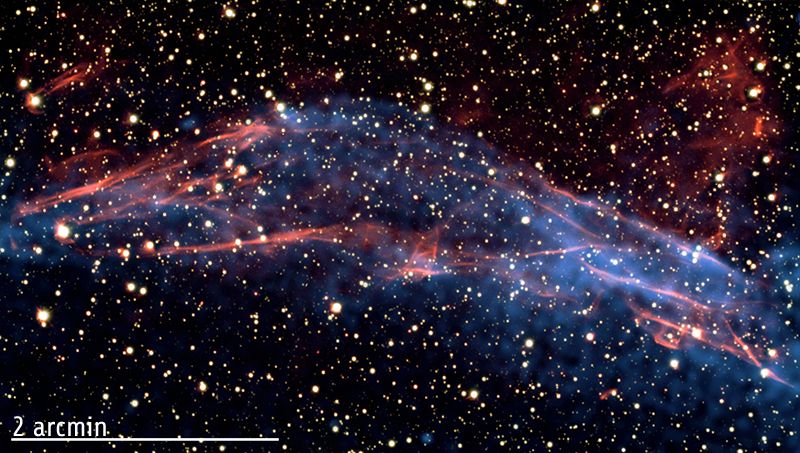 The VLT data (colored red in the composite) was used to measure the temperature of the gas right behind the shock wave created by the stellar explosion. Using X-ray images from Chandra (blue), taken three years apart, the researchers were also able to determine the speed of the shock wave to be between one and three percent of the speed of light. The temperature found by these latest results is much lower than expected, given the measured shock wave's velocity. The researchers conclude that the missing energy goes into accelerating the cosmic rays. Credit Optical: ESO/E. Helder; X-ray: NASA/CXC/Univ. of Utrecht/J.Vink et al.